I just returned from a fantastic two week trip to Oman (with a weekend in the city state of Dubai, in the United Arab Emirates). Most people may have heard of Dubai before, but unfortunately, Oman is off most peoples’ radar. Perhaps that’s because its not capturing the headlines like some other countries in the middle East. Oman is on the south east side of the Arabian peninsula. Its a safe, stable country, without any of the extremist, terrorist, ultra-conservative nutjobs that have infested places like Syria, Iraq or Afghanistan. This trip was my first time in the middle East, and I’d easily say that I wouldn’t mind returning some day. I flew Emirates to Dubai, laid over there, and then the following morning caught an early, 40 minute flight to Muscat, the capital of Oman. flight, it was OK. There were 3 or 4 babies within a few rows of me who cried sporadically the entire flight. Also, across the aisle from me was this elderly gentleman in a pin stripe suit who apparently had an Iraqi passport. I overheard the flight attendants talking to him about what it was like living in Iraq with Saddam in power. One other quirk was that all the signs in the plane bathrooms were in 5 languages. Once off the plane it was a very long walk to immigration, but I got a short line, and the female immigration agent (wearing a burka) stamped me in without any issues. I then had another long walk to get outside to ground transport. As soon as i stepped outside, the heat hit me like a wall. It was 93F when we landed just after 7pm, and it felt super humid. I think most of the problem was all the fast walking that I was doing inside the terminal. I had to wait 20 minutes out there for the hotel shuttle, and i was dripping by the time he pulled up. It was then a 5 minute ride to the hotel. No problems with checkin, and the AC in the room worked well. driving like maniacs. Holy jebus, it is so damn hot. I foolishly thought that it would be hot, but it would be a dry heat, because of that whole desert thing. But its humid here too. Currently 94F with 74% humidity which Wundergound says feels like 122F. Anyway, the mosque and the grounds were absolutely gorgeous. I was able to enter the library, and the main prayer hall (both of which were nicely air-conditioned). The grounds were beautiful too, with many pretty mosaics, and (water wasting) landscaping. I was at the mosque for over an hour. Other than a small German tourist group, I basically had the entire place to myself. Afterwards I drove clear across the city to the eastern edge, to see a museum which focused on the cultural history of Oman. I ended up getting lost twice while driving there because the road kept forking with vague signs, pointing to distant cities, which meant nothing to me. It wasn’t a big deal, mostly a minor annoyance. The museum was really nice. It had a lot of historic and traditional clothing, jewellery & weapons on display, with well written signs in English. I finished at the museum just after noon, and thought that I’d wander around the neighborhood looking for somewhere good to eat lunch. I don’t know if Omanis just don’t like to eat out, or if i just haven’t stumbled on the part of the city with places to eat, but i found nothing. I wandered aimlessly on the ancient non-grid layout streets & alleys, working myself to a horrible sweat, and then gave up. I retreated back to the awesomeness that is AC in the car, and drove back towards the waterfront part of the city, hoping to find somewhere to eat there. I ended up eating at this hole in the wall ‘juice & sandwich’ shop, where i got a falafel sandwich with a huge glass of mango juice, all for about $2.25. Next i started driving towards the hotel. Along the way i stopped in a huge western style supermarket (Lulu Hypermarket), where i wandered around for a bit, and bought two 6L jugs of drinking water. They had the most amazing deli counter, with a dozen types of olives, tons of cheeses from all around the region, ten different types of hummus, and other food items which were not made from pig. They also had a huge hot prepared foods counter, with a wide array of Indian foods, plus some kabobs. Made me regret settling on my cheap lunch. The next day, I checked out of the hotel in Muscat, and started driving about 90 minutes southeast towards the coast. Once i got on the outskirts of muscat the road turned into a 4 lane modern freeway, with real exits and gas stations, and everything. They even bumped up the speed limit to 120kph, but also had these stupid speed cameras about every other kilometer. They were kinda comical, because other than huge trucks and me, just about no one was going below the limit, and they would simply slam on their brakes as they approached the camera, then speed up again. The road was quite scenic, crossing these huge rugged mountains, which reminded me a lot of Nevada. I got to my first stop of the day just after 9am, Wadi Shab. Wadis are basically just deep rocky canyons, which flood after it rains. This particular wadi is famous and popular because it empties out to the sea, and is so deep that it has water in it year round. They even had a paved parking lot, and public bathroom with western toilets, its so popular. The parking lot was more than half full when i arrived. The weird thing is that the water isn’t all in one part of the canyon, so in some places its anywhere from a few inches to many feet deep, then it will be completely dry and rocky or sandy, then more water further up. The area right near the parking lot actually had a lot of deeper water, and there were these guys with several speed boats who were ferrying people to the opposite side of the canyon, where there was a dry hiking trail. It took all of 30 seconds in the boat, and i was on the opposite side and started hiking. The canyon was really quite pretty. There were also people farming on terraces, where they had date palms and other plants growing, syphoning the water from the canyon floor. At one point i passed this old bearded guy, and a barefoot boy younger than David, walking three donkeys with bales of plants strapped on their backs. After hiking for maybe 30 minutes, i reached a point where the water started to get deep, and there was a rocky cliff which ran maybe 30ft up along the side of the canyon. I eventually came to this group of maybe a dozen young-ish men & women, who were jumping off the cliff and swimming in the water below. I have no clue how deep the water was, but some of them were diving off the cliff head first, so presumably, it had to be maybe 20+ ft deep? Regardless, the water had this nasty green tint, so as refreshing as it looked (cause it was super hot & humid), i didn’t even want to dip my toes in, much less jump in. I watched them for a bit, then hiked back to the starting point to catch the boat back over to the parking area. At this point, i drove about another 2 miles further east on the coast, through the tiny town of Tiwi, to Wadi Tiwi. Somehow, this wadi had a paved concrete road running about 3 miles up, until it ended abruptly at a dry fall. There were no other people around, and i decided that it was just too hot to start hiking further. It was just after 11am, and i was getting a bit hungry, so i started studying the map for somewhere to stop to eat lunch. I saw the city of Sur was about 65 miles away, along the route that i needed to drive. I actually found a supermarket on the map there, so i planned to get something to eat there, and also, get gas. I’ve finally gone to a country where gas is much much cheaper than at home. I pulled into a Shell station, and filled up for the sum of 0.12 rials/L (about $1.20/gallon). Sadly getting gas in Oman is a bit of a hassle. First, they have mandatory gas station attendants (who are always Indians), so i can’t pump my own gas. Second, they won’t accept credit cards, but every gas station has at least one ATM. And third, they don’t seem to understand the phrase ‘fill it up’, so every time, i get drawn into this awkward conversation, as i struggle to convey to them that i really do want them to run the pump until it shuts off on its own. I’ve also found that Indians are basically the Mexicans of Oman. They hold all of the menial, manual labor jobs, like road crews, cooks, and gas station attendants. After getting gas, i found the supermarket, where i purchased a block of Saudi feta cheese, green olives, a package of pita-like flat break, and 2 cold juice boxes (1 mango, the other lychee). I took it all back to the car, and ate a really yummy lunch. While i was eating, i was watching the world go by, and saw this crazy goat (yes, Oman has wild goats everywhere), jump up on the hood of a car. It was hilarious. Also, i heard the mid-day call to prayer from multiple mosques in my vicinity. Once i finished eating, it wasn’t even 1pm yet, and I estimated that i had a 2 hour drive to the meeting point for the sand dunes camp, but didn’t need to arrive until 4:30pm. Since i had over an hour to kill, I figured that i’d explore Sur a bit more. Most of the city was endless strip malls of shops selling either boring (furniture) or bizarre (beard trimming, burkas) stuff. However, once i got to the waterfront, it was quite scenic. There were dozens of fishing dhows in the water, and i could see the old part of town, with the ancient architecture. After getting briefly lost as i attempted to navigate out of the city, i was back on the main road. However, continuing south, through the round-about (oman absolutely loves them, they’re everywhere which has is an intersection), the awesome, modern 4 lane divided highway ended, and now i was on an ordinary 2 lane road, for the rest of the day. There was nothing wrong with this road, it was in good condition, but now i had a slower speed limit, rarely any shoulder, and slow moving trucks. Despite all of this, i still managed to get to the sand dunes meeting point in this tiny town over an hour early. I was hoping to find a cafe, or maybe an air conditioned hotel lobby to relax in while i waited, but nope. There was nothing like that in this town. What i ended up doing, was parking in the shade of a gas station, rolling down the windows, and attempting to read. It wasn’t horrible, but i did get to see this pickup truck pull in with 5 camels sitting in the back. It was like clown car crazy time, as their goofy heads were bobbing all over the place. Finally 4:30pm arrived, and this young guy pulled up, introduced himself, and we drove out to the camp. The dunes are quite pretty, as the sand is reddish in color. Along the way, we stopped so that he could help his father feed their camels. Camels are such goofy animals. At one point they were drinking water out of a trough, and making slurpy sounds, then they’d lift up their heads, and shake them side to side, with water spraying everywhere. Next we drove the rest of the way to the camp. It was quite pretty, nestled in a dune valley. Turned out that i was the only guest that night, as its still considered the low season (aka, hot). So even though they had 14 guest huts, mine was the only one occupied. They gave me the option of either sleeping in the dark, stuffy hut, or they could move the bed outside. I chose to sleep outside. Next i hiked up the dunes to watch the sun set. While it was pretty, a storm front was moving in, and pretty quickly, dark clouds obscured the setting sun, and wind was blowing sand everywhere. I walked back to the camp, and spent some time chatting with a few of the guys who worked there. They said that in the summer, they often get sand or windstorms, sometimes even with lightning or thunder. I actually saw quite a lot of lightening off in the distance but we never got rain, just clouds. While they were preparing dinner, they made some hot milk tea, which was actually really tasty. Finally the food came out, and it was awesome. There was this fancy basmati rice with a bunch of seasoning, assorted chicken parts, tomato & cucumber salad, roasted curried vegetables, flat bread, hummus, and mango juice to drink. Dessert was freshly picked red dates. While we were eating, i noticed that no one else was using utensils. They commented that its actually the traditional Omani way to eat is with just your fingers. After dinner, they brought out more tea, and i talked with one of the guys for a while. The camp is owned by the older man who was feeding his camels earlier, but mostly run now by 2 of his 6 sons. The guy i was talking with is the youngest of the sons. he said that the majority of their guests are from Germany, and they get very few Americans. He then proceeded to ask me tons of questions about what its like in the US. He was curious about the weather, how many cars i owned, what the deserts were like compared to Oman, whether it was legal for a man & woman to live together before marriage. That last one really seemed to interest him, and he mentioned that its legal in Oman for a man to have up to 4 wives at a time. I asked him if he wanted to have 4 wives, and he smiled and told me no. He was also very curious about the food. He commented that goat & sheep were the two most popular meats in Oman, and only city people ate beef at all. Around 9pm i was getting very tired, and went to bed. I slept well, until 4:30am, when i was wide awake for the day. I ended up seeing the sunrise over the dunes just after 6am. Breakfast was omelettes with tomatoes & onions, baked beans with curry sauce, sliced tomatoes, and hummus and huge dosa, with orange mango juice. It was all really tasty. I relaxed for a little bit after breakfast, and then headed out for the day. The first couple hours of driving the roads were miserable, with a lot of traffic, and slow trucks. But after that the roads cleared up, and I was making good progress. By late morning i had been driving over an hour from the last town, and i was in the middle of a flat, completely barren desert landscape. Amusingly the only thing that i did see for a while were herds of camels wandering about. After driving about 120 miles of empty void, i finally came to this tiny town, with a gas station, and a small restaurant next door. I gassed up, and then went into the restaurant hoping to get lunch. The place was completely empty at first, and i was somewhat concerned about getting some horrible food poisoning from this place. To make matters worse, the guy working there could barely speak or understand any English, and didn’t seem to have a printed menu. Eventually, I figured out that he was trying to ask me what kind of meat i wanted, so i told him chicken. He disappeared into the kitchen for a a few minutes, and i was left to ponder what he was going to bring out. While he was back there several other small groups of people showed up, and the place started to fill up. Finally he brought me what i think was chicken biryani, with a small bowl of super spicy brown curry sauce, and a dish of sliced up purple onions. The one thing he did not give me were utensils. So, i ended up eating it all with my fingers. The food was actually pretty tasty, although trying to eat rice with my fingers was super frustrating initially. The final bill for my lunch was about $3. Most of the time driving after lunch was through many miles of sand dunes, and blowing sand. Shortly before entering Duqm, the sand dunes ended, and i arrived at the hotel just before 3pm. The hotel that i’m in tonight has a phone book, a koran and a prayer mat. The phone book is hilarious, because the listings for people whose last name starts with A is literally like 90% of the book, because apparently just about everyone in this country has their last name starting with ‘Al-‘ . I was ready to check out of the hotel this morning at 7am, but instead got into a heated argument with the front desk clerk, who insisted that i needed to pay $110 for my room. I insisted that i paid in advance when i made the reservation 5 months ago. We kept arguing in circles, with him calling random people on the phone,all of which kept taking his side. Finally he pulled out all the paperwork associated with my reservation, and 4 pages back was this page titled in huge letters “PRE-PAID RESERVATION”. I noticed it reading upside down, and started pointing and telling him to read it. At that point he admitted he was wrong all along, handed me a receipt stamped ‘paid in full’, and i walked out. Of course that nonsense wasted nearly 30 minutes. For the most part, all of the driving today was easy, with very little traffic, and i saw some amazing scenery. 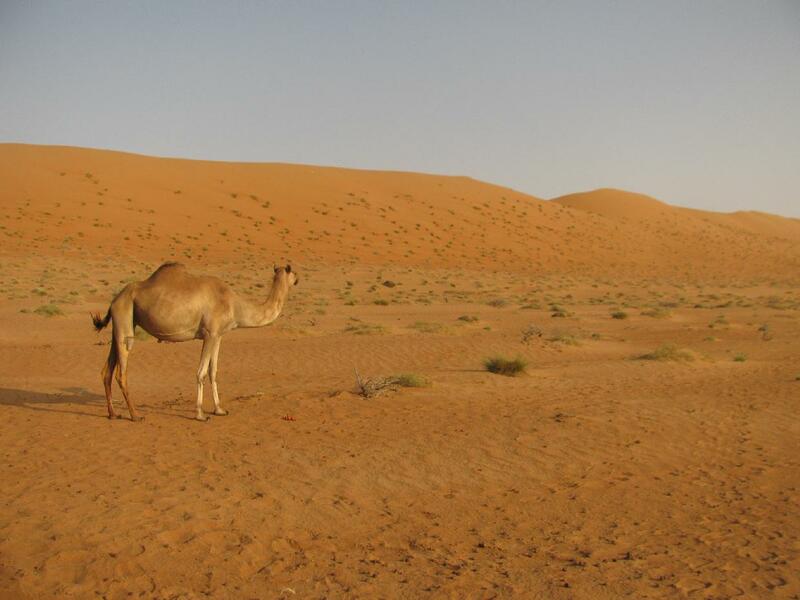 I spent much of the morning, driving through very barren, flat desert, with just the occasional camels wandering about. Eventually i reached the coast, and it was pretty turquoise water, and sandy beaches for a few miles. Then i climbed this ridiculously steep road up the side of a mountain (they don’t seem to know about switchbacks), and drove across this plateau for a while. Up until 6 months ago, the pavement effectively ended up there, and the ‘road’ turned into a single lane rocky track,which hugged the side of the cliff above the ocean for nearly 40 miles. However, the new road was recently finished, and its amazing. The road itself is as good as any new road in the US, with well painted lanes, reflectors in the pavement down the center line, wide shoulders, pullouts for slower traffic and good signs. What made driving this route (rather than the inland desert road) completely worth it was the views. There was the ocean & coastline stretching out on one side, and then what looked very much like the grand canyon on the other. it was if they took the best views from the PCH and Grand Canyon and put them in the same place. Eventually, i descended down to sea level, and effectively the end of the new road, and came upon a police checkpoint for some bizarre reason. They gave me a very confused look, and waived me through. At that point, the road hugged the coast, but was mostly flat. I did see quite a few camels wandering the beaches, which was an odd sight. About 90 minutes from Salalah, i realized that it was no longer rocky, or brown desert, but instead the mountains were covered in green grass & trees. Apparently they get summer monsoons off the Indian ocean in July & August, and everything starts growing. It was so pretty, and reminded me of how the hills look near our house in winter. I even saw cows grazing. Today was much cooler than its been. The highest temperature was 34C (yesterday was 44C), and it was actually 29 when i came into Salalah in the afternoon. The hotel that i’m in looks like it was built in a different century. Its this huge 5 story building, with marble and granite everywhere. My room has marble floors, and the doors are carved wood. Plus my room is likely half the size of our house. Its absolutely cavernous. I’ve got 3 huge love seats, a coffee table, a king sized bed, a desk, and yet the room still has empty space where they could put more furniture. For dinner, i went to a Lebanese restaurant, which was a 5 minute drive from the hotel. The food was really good. I had an appetizer sampler with hummus, babbaganoush, yogurt, and two kinds of salad. My main course was 5 different types of kabobs, with flat bread, and onions. It had lamb, chicken,beef, mutton and goat. Also, i’ve decided that lime & mint juice is my new favorite drink. I’ve now had it 3 different times, and i’ve enjoyed it every time. I started the day driving about an hour northeast of the city, up in to the mountains to the Tawi Attair huge sink hole. The weather here is so bizarre, as compared with the rest of the country. It was cloudy & foggy, and cool when i left the hotel. The drive up there was beautiful, with lots of green grass, and trees & bushes. The sink hole it self was a bit of a disappointment. While it was huge (like several city blocks across), it looked more like a very steep canyon, than a hole in the ground. Next i drove back into the city, to the UNESCO Al Balid Ancient city site. The city existed from around 800 until 1600, and was quite large. Today, its mostly ruins (walls, etc), but they have a really awesome museum with tons of artifacts found at the site. The grounds of the museum are nicely landscaped, but they also have a trail that runs around the perimeter of the site, with interpretive signs. Between the museum, and walking the entire trail, i spent about 2.5 hours there. It was almost noon by the time i finished up, and figured it would be a good idea to get lunch. There was supposed to be a fairly new western style mall on the west side of the city, and i was hoping that they’d have somewhere interesting to eat. Alas, i was a fool, and the mall had many of the same crappy food court options that we have at home. KFC, Subway, Mcdonalds, 2 other fried chicken places, a scary looking ‘Italian’ place, a scary Indian place, and a Lebanese place. The Lebanese actually looked ok, but since i had that last ninth for dinner, i really didn’t want to eat that again. There was a large supermarket attached to the mall, so i went in there. I settled on this chicken & peppers thing, plus a mutton samosa. The samosa was ok, but the chicken thing was awful. I don’t feel sick from it (yet), so i guess for $3, i got my money’s worth. After lunch, drove about an hour west of the city to Mughsayl beach. It was quite pretty (and the beach was completely devoid of people), but the waves were huge, and there were very few shells. At that point curiosity got the better of me, and i continued driving west for a while. No, i didn’t try to enter Yemen, but i did get about 25 miles away before turning back. A few miles before i did turn back, there was actually an army checkpoint on the road. They were armed to the teeth, with huge guns on the roof of their vehicles, and all the soldiers had huge automatic weapons slung over their shoulders. As i drove up, it occurred to me that they were almost certainly going to ask where i was going, and i had no clue how to answer them. They asked for my passport, and thumbed through it looking for the Omani visa. At one point he turned the passport upside down, i guess to read one of the stamps. Then he asked where i was going, and the best answer that i could come up with, was the truth, so i said “i’m just exploring”. I figured he was going to force me to turnaround at that point, but instead he smiled, wished me a good afternoon, and waived me on through. So i guess a goofy looking American is considered harmless in Oman? I also didn’t quite understand why they were stopping people heading towards Yemen. Shouldn’t they be more concerned about al queda & friends coming from yemen? Anyway, after that, i drove a few more miles, when i saw a sign for a completely different sink hole than the one from this morning. I figured i’d check it out, then head back. This road to the sink hole was fully paved, but went through the middle of no where. There was so much cow dung on the road in some places, that i couldn’t see the road. It was disgusting. The sinkhole itself was actually larger and more impressive than the one this morning, so it was worth checking out. Afterwards, i started driving back to the city. The army guys just smiled and waived me through this time, without even stopping me. For dinner tonight, i went to a vegetarian Indian restaurant. I ordered garlic naan, paneer masala and a mango lassi, all for about $6. The food was very good. It also came with a plate of sliced carrots, cucumbers & purple onions. The naan had tons of minced garlic. The paneer was super spicy, but very flavorful. When i attempted to checkout of the hotel this morning i went through another round of the same nonsense, where they claimed that i needed to pay for my room, even though i had paid when i reserved it 5 months ago. Thankfully, it only took them 10 minutes and 2 phone calls to get it sorted out this time around, and then i was on my way. The first hour of driving was pretty, as i climbed into the green mountains, and through the fog. After that i reached the frankincense forest. While there were a few hundred trees, it was mostly boring, as there wasn’t much else to see. Apparently the harvest season is in the spring, so there wasn’t anything to look at or smell. Afterwards, i spent much of the next 8 hours driving across the most barren, flat, desolate landscape i’ve ever seen. Initially, it was kinda cool to stare off into the empty void, but the novelty of it wore off quickly, and it became painful monotony. this was technically along the southern edge of the Arabian ‘Empty Quarter’, so it made sense. Its a good thing that i had a ton of podcasts to listen to, as i would have lost my sanity if i had to drive that distance without any mental stimulation. I stopped for gas & lunch at this sad, remote rest stop just before noon. It was gradually being taken over by the desert. There were literally piles of sand blown up against the walls of the building, and the gas pumps. I ended up eating this huge plate (with my hands) of mutton biryani, which was decent (about $3.25 including a bottle of water). The rice was actually quite nice, with lots of saffron, cloves, cardamom and cinnamon sticks still i it. After that it was nearly another 5 hours of driving through the wasteland. The last hour returned me to relative civilization, with random trees & plants growing about, and some Nevada-like mountains off on the horizon. Thus far on the trip, Google’s routing has been perfect, but it failed me twice today, in the last hour when i was attempting to find the hotel. First, they attempted to route me down a dry wash, which they claimed was a real road. Thankfully, i was able to figure out a sane detour on real roads. Then they sent me to a location which they claimed was the address of the hotel, but it was no where to be found. Turned out that the hotel was at the opposite end of the town, which i figured out just by driving through the town, with the assumption that i’d have to find it in this small town eventually. The hotel itself is quite nice, especially considering that Tripadvisor only lists 2 hotels for this town. I can clearly see a mosque from my room window, so I might be getting an early wakeup call. The plan for tomorrow is to explore the area, as there are 3 different historic forts within an hour’s drive, plus a UNESCO site. Oman really loves speed bumps. There are at least 2 at both ends of every town, often 4 or even 6. The best part is that they don’t always mark them, so i’m often slamming on the brakes at the last second to avoid launching the car into outer space. Overall, i had a really nice day. I visited three different forts (Jibreen, Bahla & Nizwa). The first (Jibreen) was really nice, with lots of signs explaining the purpose of the rooms. It also had tiny bats in one of the stairwells. The second (Bahla) was huge, and looked more like a medieval castle. Unfortunately, it had almost no signs at all, so it became a bit monotonous wandering around a bunch of empty rooms. The last (Nizwa) was the smallest of the three, but had a really nice museum explaining the history of the region. Other than 2 Germans at the last fort, i had them all to myself. I had an awesome lunch at a small restaurant. I ordered lime mint juice and chicken 65 ( http://en.m.wikipedia.org/wiki/Chicken_65 ). However with the meal, i got a plate of sliced tomatoes, cucumbers & carrots, a small bowl of raita, and a huge plate of the most amazing saffron rice. The rice had golden raisins & cashews, plus a ton of seasoning. I spent the morning exploring Wadi Ghul, which is supposedly the grand canyon of Oman. I’m not sure that its anything like the grand canyon, however, it was quite impressive and beautiful. The walls of the canyon were very steep and hundreds of feet tall. After walking a short distance, i started to come across pools of water, and then further on, flowing water. Many of the pools had tadpoles in them, and i also saw two frogs. after about an hour, decided to turn back. At the entrance to the canyon, there’s the old village (ruins) on one side and the newer (modern) village on the other. I wanted to explore the ruins, but i couldn’t find an obvious way to reach them, as they’re situated up on a hill above the canyon. Eventually, i found a path which seemed like it would lead up there. However, as i was walking, i glanced down into the wash below, and noticed a man walking briskly across the wash from the new village in my direction, and he appeared to have a gun strapped over his shoulder. Immediately, i froze, and waived and called out ‘hello’, with the hope that he’d realized that i did not have any bad intentions. Once he reached me he asked, in broken English ‘where are you going’, and i gestured at the old village. He reached out and shook my hand, and said ‘i show you’, and i followed him all the way to the first building. after which, he shook my hand again, and walked away. it was definitely kinda tense for a minute there, but beyond that it was fine. Perhaps he always has a gun with him. Or maybe, they’ve had problems with vandalism of the old village site. I dunno. Anyway, the village looked like it was quite old, as all the buildings, were made from mud, straw and stones, with some wooden beams in a few places. I looked around for a little bit, but it was around Noon at this point, and getting unbearably hot, so i headed back to the car. I drove for a little while to the nearest town with shops, and went into a restaurant for lunch. This was another of those places where the guy simply asked me what kind of meat i wanted, and then they brought me food. I asked for chicken, and out came a crazy number of plates. First came a small bowl with this thick yellow broth, with onions and what looked like two sheep(?) vertebra. It tasted like they basically had been cooking it for hours, as it was super rich. Then a small salad with tomatoes & cucumbers. Then came the main course. A huge plate of saffron rice, with the usual assortment or yellow raison, cashews, and spices, and a separate plate with half a roasted chicken. The chicken had been cooked i yellow curry powder, and was so tender that it was falling off the bones. It was amazingly delicious. then when i was maybe half way finished eating, he brought me another small bowl, with what seemed to be blended up salsa. It was pink and frothy, but had a spicy kick, and really tasted like someone had thrown all the salsa ingredients into a blender. I was very confused, ad it didn’t seem to go with anything else. I ended up just drinking it from the bowl. I have no clue if this is some Omani thing, or some obscure Indian condiment, or what. Anyway, this huge lunch cost about $3.50. Afterwards, i had to drive to my hotel for the night. Its actually this bed & breakfast, up in this old remote mountain village. This village is so old, that the paths and ‘streets’ are too narrow for cars. So i had to park at the edge of the village, and then walk through it to the B&B. When i arrived they gave me a tray with fresh dates (the brown kind, which i liked) and Omani coffee, which is made with both coffee beans and date juice. The coffee was ok, but the last thing that i wanted was a hot beverage in this heat. the village is amazing. Its full of these stone homes, with narrow curving alleys. One side of the village has hundreds of date palms and banana trees. Also, the village has this awesome system of tiny canals, which all have water flowing through them, so everywhere you go there’s always the sound of water. passing me every few minutes going the opposite direction though, so as remote as it seemed out there, it got a decent amount of traffic. At about the half way point, as i was crossing a dry wash, this huge SUV approached from the opposite direction. But instead of just giving me a friendly waive as he passed, he was frantically gesturing for me to stop. I pulled up beside him and rolled down my window. It was a car full of Germans, and they wanted me to confirm that they were on the right road to a town that was at least a 4 hour drive from there. I confirmed that they were on the right road, however, the direction that i had just come from was rather confusing to navigate without a GPS. The guy said that they had ‘good’ written directions. I was thinking, if their written directions were so good why were they asking me for help? Anyway, I wished them good luck, and continued. the amusing part is that the remainder of the road for me after that point was really easy driving. So if the Germans were freaking out with their good directions after the easy part,i’m not sure how they would ever do the difficult section. After another hour of driving i reached my first stop of the day, Al Rustaq fort. It was a bit after 10am, and already over 100F. The fort itself was almost completely empty of people, so i was able to explore it in peace. The most interesting part was this diamond shaped tower. Afterwards, I drove another 30minufes to the town of Al Hazm, to see a 600 year old castle. The castle had the best signs of any historic building that i’d visited in the entire country. They even handed me a brochure with a map when i paid the $1.25 entrance fee. once i was done there it was past noon and i was getting quite hungry for lunch. However, what i forgot was that since it was a friday, it was the muslim holy day, and just about everything shuts down after 11am. As i drove through town, every restaurant was closed. I started the 150km drive back to Muscat, hoping that i’d find something. As i was driving i noticed all of these guys running across the highway, and they were going to what was likely the only open ‘restaurant’ for miles. I went inside, and asked for chicken, assuming that i’d get the standard biryani. While that’s technically what i was served, it was easily the worst meal i had in the entire country. The rice had almost no spices, the piece of chicken was maybe half a thigh, and there was no side salad. Thankfully, they only charged $2.50 for this mess. I ended up pulling into Muscat just after 3pm, and had a few hours to kill before returning the car at the airport. after driving around for a bit, i found an air conditioned cafe with free wifi, and hung out there for a while. The airport was kind of sad. The food choices all looked terrible. Also, i had to go through security just to get my boarding pass, then again to get to the gates. i was semi-amused when they blasted the call to prayer over the PA system. The flight didn’t start boarding until just 25 minutes before scheduled departure time, but somehow we managed to take off just 10 minutes late, and still landed 5 minutes early. I experienced what was possibly the easiest immigration routine ever, and was sitting in the taxi to the hotel about 5 minutes after getting off the plane. the hotel room is like japan size, but otherwise nice. I spent the first of two days in Dubai basically just hiding indoors to escape the heat. i spend much of it walking the dubai mall, people watching. Besides the assortment of muslims in all manner of variations of traditional garb, there were a lot of Indians, and way more Russians than i ever would have expected. I also watched people ice skating, which is super bizarre, when they are dressed for winter while its 110F outside. For lunch i went to the food court, which is very impressive for a mall. I had to choose between Greek, generic mid-eastern, Iranian, 2 Lebanese, 3 Chinese, 2 Japanese, kfc, burger king, a falafel place, Moroccan, mcdonalds, 2 pizza places and 5 different Indian places. I ended up getting some paneer masala with naan the size of my head & a salad. Oh, and i got an avocado shake from a juice place. Just before dinner, I went to the top of the tower, which was kinda impressive, as they had an outdoor viewing deck on the 124th floor. After dinner I saw the fountain show outside the Burj Khaleefa. It was ok, but really not much different than the Bellagio. They played Michael jackson’s Thriller, which seemed incredibly odd. The only added touch was that they had hundreds of strobe lights all over the tower, which were synchronized with the music. On my 2nd and last day in Dubai, I skipped breakfast because it was already after 9am by the time i headed out. I ended up doing the walking tour that i had originally planned to do yesterday. I started off near the waterfront, at the fish market. I knew that i was in for a special experience when i could smell the market before i could see it. sure enough the market was not in doors, or air conditioned. While the fish was on ice, and shielded from direct sun, there wasn’t anything keeping the air cool. Despite that the place was still quite busy & crowded. Also, in addition to fish, there was a produce section, a date section, and a meat section. Interestingly, the meat section was comprised of these tiny butcher shops, all of which were air conditioned. As i was wandering through the produce section, one of the vendors saw that i was just dying from the heat (i was completely drenched in sweat), took pity on me and sold me a coconut for less than the price on the sign (which worked out to about $1.20). Granted the sign price might have been the starting point for bargaining, but still for that price, it was worth it. Later when i was longingly walking past the butcher shops, one of them motioned for me to come inside to cool off. It was amazing inside, and must have been half the outside temperature. I sat in there for a while, watching him break down a goat. After the market, the rest of the walking tour wasn’t all that great. It was brutally hot, and much of the time i was walking past lots of tiny shops, all selling the same stuff. Also, i was supposed to take a water taxi across the creek, and got ripped of by one of the boat drivers. He represented himself as a water taxi, but once i was on his boat, he changed his story, and was insisting that i pay about $30 for an hour long cruise. I refused, and eventually worked him down to about $12, but then he basically parked the boat at a random spot, insisted that i get off there. I ended up having to walk much further than i had planned as a result, but thankfully the sneakers didn’t hurt my feet much. At this point it was after noon, and i was starving, and desperately looking for somewhere to eat lunch. I settled on the first place that i found, which was basically a tourist trap, as everyone eating there was blatantly a tourist (mostly Japanese). The food wasn’t bad, but it was quite overpriced. After lunch i walked through the old part of the city, which was basically just 3 buildings, which looked sad and run down. I then walked to the nearest subway station, and returned to the hotel. So, hardly the best day of the trip, but i never expected Dubai to be a highlight. For the curious, I’ve uploaded a GPX file of the route that I drove HERE. All of the trip pictures are posted HERE.